Contrary to popular belief, Christmas weekend was good in the Boston sports world. Sure it was tough seeing the C’s lose yesterday but you have to look at the bigger picture. We’ll start out Friday with the Bruins absolutely annihilating the Panthers at home 8-0. Brad Marchand capped the day off with his first career hat trick en route to stretching the B’s win streak to 6 games. At this point I think it’s safe to say the best team in Boston resides on the ice. How can you argue with a team that has won 20 of its last 23 games and gone from zero to hero in a span of two months? Then we can look at our AFC East champion Patriots. People forget that they’re one win away from clinching top seed in the AFC and home field advantage throughout the playoffs. It’s a bit sketchy watching them go down 17-0 to Miami at halftime, but they always find a way to win down the stretch. One more win against a struggling Buffalo team and the road to the Superbowl for the AFC goes through Foxboro. Christmas Day was a bit unsettling as we watched the Celts fall to the Knicks 106-104, as it always hurts to lose to New York in any sport. But not all was lost in this game. The C’s proved they could play ball. With Pierce out and Pietrus awaiting a physical, it was good to see a few Celtics step up. The loss was tough to handle, but more can be taken away from the game. I still feel good, if not better, about the C’s as they continue their season this week. Ideally it could have been better, but again it’s hard for Boston sports fans to complain today. Happy Monday! 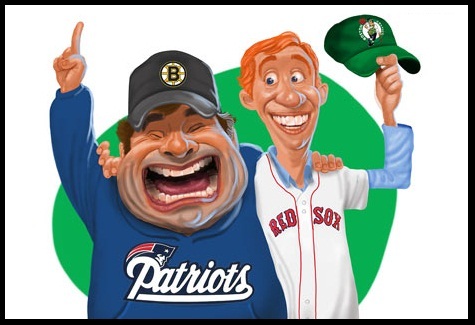 This entry was posted in Bruins, Celtics, Everything Else, Patriots and tagged boston, bruins, celtics, christmas weekend, nba, nfl, nhl, patriots by jtulz07. Bookmark the permalink.